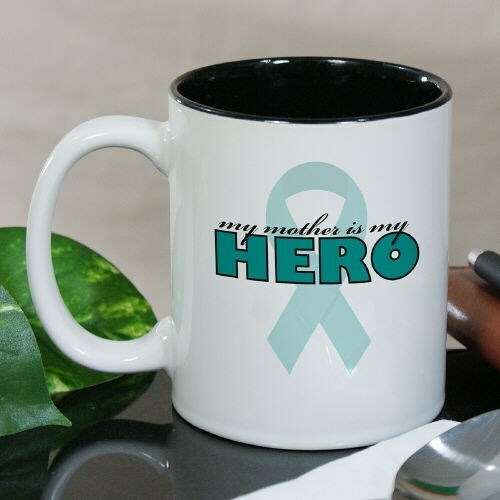 Support your hero with this great Personalized Awareness Coffee Mug, whether it’s your Mother, Father, Sister, Brother, Friend or any loved one you know battling with any condition. Our Hero Coffee Mug lets you choose the awareness color of your choice so you can promote any awareness you'd like. Perfect for showing the support & determination you have in finding a cure. This Awareness Coffee Mug is dishwasher safe and holds 11 to 20 oz. Select from eight different mug styles. Personalize this Awareness Coffee Mug for FREE with any one line custom message and be sure to choose one of our color choices below and start spreading your awareness today. Additional Info MyWalkGear.Com offers a variety of Awareness products like the Awareness coffee mug! Show your support with this mug or our matching My Hero Awareness T-Shirt and our Awareness Pins as well!